Last updated by Frankye at December 11, 2013 . Cyber Monday: see the deals OnTimeSupplies.com and get free shipping with our coupon code. Hope you had a great Thanksgiving – that that your football team won, and the food was good and plentiful! Office Ink is pleased to report that our cranberry relish and pumpkin pie were huge hits! Now it’s time to get back to work, but you know you have to carve out a little bit of time to take advantage of Cyber Monday deals and do a little Christmas shopping! 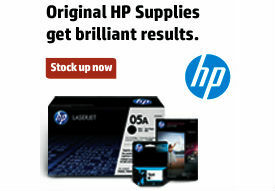 Check out the Cyber Monday deals at OnTimeSupplies.com! You’ll find huge markdowns on office equipment, discount office supplies and a huge office furniture clearance sale! You can also get free shipping qualifying office product purchases with coupon code THANKS919! Whether you need to stock up on office supplies or get a great gift for the office Secret Santa party, you’ll find what you need at the best price online at OnTimeSupplies.com. Energy efficient space heaters: how to choose the most efficient space heater. It’s cold outside and inside. In these tough economic times, you don’t want to crank up the thermostat and risk a high utility bill, so invest in one of the energy efficient space heaters for sale at OnTimeSupplies.com. The site’s Knowledge Base features a great article breaking down the best type of space heater for a variety of work areas. Office Ink will show you what to look for in an energy efficient space heater for your home. Use radiant space heaters and panel heaters for spot heating. Radiant space heaters and panel heaters are the most energy efficient space heater option: they require about a tenth of the energy as traditional convection space heaters. However, they are not designed to heat a whole room. These energy saving space heaters work best as spot heaters. For example, a radiant panel space heater will work great under your home computer desk to keep you feet warm. They won’t do so well heating your home office. Use ceramic heaters to efficiently heat an entire room. Oscillating tower style ceramic heaters are the most energy efficient space heaters when it comes to heating a room, though a standard box style ceramic heater works well too. In addition to a ceramic heating element, your energy saving space heater should have a thermostat and allow for automatic temperature control. Without these features, you’ll have to constantly monitor your electric space heater to keep it from wasting electricity, and overheating the room. Energy efficient space heaters also feature automatic shut off so they aren’t running when they aren’t needed. With an energy efficient space heater and a comfy sweater, you’ll stay warm all winter without seeing your electricity bill go through the roof. Holiday travel tips: see the best online Thanksgiving travel tip guide. It’s hard to believe that Thanksgiving is just around the corner and that the holiday season is upon us. With the joy of the holidays comes the stress of holiday travel. Office Ink is here to help with travel tips. Whether you’re traveling by plane, train or car our holiday travel safety tips, air travel tips and travel packing tips will ensure your Thanksgiving travel trip is safe, comfortable and fun. As you make your holiday travel plans, use Office Ink travel tip guide to pack for your Thanksgiving travel trip. Travel first aid kits – I like the mini first aid kits by Johnson & Johnson because they are small enough to fit in any purse or carry on luggage. Plus, they contain everything a personal first aid kit should: antiseptic wipes, Tylenol and bandages. Sanitizer wipes – I pack Purell hand sanitizer wipes in my holiday travel bag instead of hand sanitizer gel for a couple reason. First, you usually can’t bring liquids on flights. Secondly, sanitizer wipes really give your hands a nice clean feeling. Road Atlas – A United States road atlas is cheaper than GPS and just as handy if you get lost. While air travel is fast and convenient, it’s often annoying. These Office Ink air travel tips will help Thanksgiving travel less of a trial. Luggage Tags – Unless your luggage is covered in pink polka dots or some other unusual pattern, the brighter and more distinctive your luggage tags, the better. You can can even make your own personalized luggage tags with a bit of colored construction paper, a permanent marker. Making personalized luggage tags is a great pre-holiday travel craft project for kids. Rolling luggage and luggage carts: You’ll probably have to run through the airport like O.J. Simpson at some point during your air travels, so make it easy on yourself with wheeled luggage or a luggage cart. I like to use rolling laptop cases as carry on luggage. Office Ink can’t show you how to fold a holiday sweater down to the size of a pack of playing cards. Our travel packing tips is a checklist of the things you don’t want to start your Thanksgiving travel trip without. Healthy snacks: Save money and calories and carry healthy snacks – like mixed nuts, Chex Mix, and diced veggies – in Ziploc bags to munch on while traveling for the holidays. You can also jazz up bottled water with powder drink mixes. Cheap digital cameras – Cheap digital cameras are more easier to find than ever, so you can afford to capture all your great Thanksgiving travel memories in holiday photos. Digital camera cases – Of course, you don’t want to have to replace your digital camera at any price, so pack your digital camera in a digital camera case. USB car charger – Keep you iPod, phone and other mobile devices fully charged with an inexpensive USB car charger. Noise canceling headphones – Noise canceling headphones are great for drowning out a snoring seat mate in a plane or train, or squabbling kids on a car trip. Unless you’re the driver, of course. Then you might just have to threaten to turn this car right around. Office Ink hopes this guide helps you have a great Thanksgiving travel experience. If you’re an experienced traveler with holiday travel tips to share, let us know. Post your travel tips in the comments of this post. Have a great Thanksgiving! Coat racks and hooks: use garment racks as space savers in small offices. Office ink is back with more free ideas for organizing clutter in the office. Now that the weather has turned cold and wet, you have to make room for your bulky winter coat in your office. Your office looks cluttered and untidy you don’t have a place to hang your coat. Plus, you need to hang your coat to dry it on rainy and snowy days. 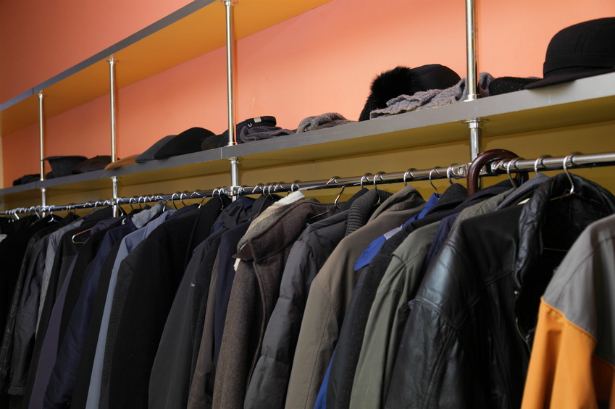 Reduce clutter in your office and give your coat a place to hang and dry with garment racks, coat racks and coat hooks. They make great space savers and add a decorative element to your office. So, garment rack, coat rack or coat hook – which should you choose? Well, that depends on the size of your office and workspace. Coat racks come in a range of capacities and styles. Wall mounted coat racks work best in smaller offices with shared work areas. You also add a little style to your office with coat racks. Metal coat racks look great in contemporary office settings, while wooden coat racks work well in offices with a homier feel. You may also want to consider a hat and coat rack – a wall mount coat rack with a shelf. If you’ve got a small office all to yourself, you might prefer an elegant clothes tree or standing coat rack. Standing coat racks are nice because they hold more than just your winter coat. You can hang your hat, scarf and even your office sweater on a standing coat rack. Many standing coat racks have built in umbrella stands for added convenience. Cubicle: hang your coat on cubicle coat hooks. If you work in a cubicle, hang your coat on a specially designed cubicle coat hooks. A cubicle coat hook slide over cubicle partitions, so you can mount them without putting any holes in the wall. In addition to being great space savers, decorative cubical coat hooks are a great way to personalize your work space. Large or medium sized office: hang coats on garment racks. If you’ve got the floor space, consider a free standing garment rack. Wheel a couple garment racks into a corner or empty workspace , and voila, you’ve got a cloakroom. You can get a garment rack in practically any size. Remember to overestimate or size up your garment rack. Many days, employees will be coming in from the rain or snow, so you can’t over pack the garment rack. It needs to big enough to leave a little rack space for ventilation. Otherwise, wet coats won’t dry. Many garment rack come with special security hangers that can’t be removed and can’t be lost. These space savers will reduce clutter in any office. You can find inexpensive coat racks, garment racks and coat hooks for sale at OnTimeSupplies.com, as well as a discount office product selection that numbers in the thousands. OnTimeSupplies.com ships most orders the same day, so your new coat rack, garment rack or cubicle coat hook arrives in just a day or two. Wall mounted coat racks work best in smaller offices with shared work areas. Like garment racks, coat racks come in a range of capacities and styles. You also add a little style to your office with coat racks. Metal coat racks look great in contemporary office setting, whil wooden coat racks work well in offices with a homier feel. You may also want to consider a hat and coat rack – a wall mount coat rack with a shelf.If you’ve got a small office all to yourself, you might prefer an elegant clothes tree or standing coat rack. Standing coat racks are nice because they hold more than just your winter coat. You can hang your hat, scarf and even your office sweater on a standing coat rack. Many standing coat racks have built in umbrella stands for added convenience. Cubicles: hang your coat on cubicle coat hooks. If you work in a cubicle, hang your coat on a specially designed cubicle coat hook. Cubical coat hooks slide over cubicle partitions, so you can mount them without putting any holes in the wall. In addition to being great space savers, decorative cubical coat hooks are a great way to personalize your work space. If you’ve got the floor space, consider a free standing garment rack. Wheel a couple garment racks into a corner or empty work space , and voila, you’ve got a cloakroom. You can a garment rack in practically any size. Remember to overestimate or size up your garment rack. Many days, employees will be coming in from the rain or snow, so you can’t over pack the garment rack. It needs to big enough to leave a little rack space for ventilation. Otherwise, wet coats won’t dry. Many garment rack stands come with special security hangers that can’t be removed so can’t be lost. These space savers will reduce clutter in any office. You can find inexpensive coat racks, garment racks and coat hooks for sale at OnTimeSupplies.com, as well as thousands of other discount office products. OnTimeSupplies.com ships most orders the same day, so your new coat rack, garment rack or cubicle coat hook arrives in just a day or two. Veterans Day Gift Guide: last minute gift ideas for the vet in your life. Veterans Day is coming up this Thursday. As you look for the perfect gift for the Veteran in your life, consider On Time Supplies. You’ll find more than a huge discount office product selection, you’ll also find great gifts for veterans. If you order today, your Veterans Day gift will arrive in time for the holiday. Plus On Time Supplies offers APO and FPO shipping, so you can send gifts to service members stationed overseas. Just how do you thank a veteran for their service? While no gift adequately thanks service personnel for keeping America safe, Office Ink has a few last minute gift ideas that do make great tokens of appreciation. Leather carry on luggage: Get you veteran leather carry on luggage for those long overseas flights. This handsome SOLO black leather overnight bag has plenty of room for a laptop, a change of clothes and more. Outdoor flag: Show your patriotism and support for veterans with an all weather outdoor flag! Advantus U.S. flags are made of durable nylon, so you can fly the flag for years to come. Personal journal: Give military personnel a journal to record experiences and adventures throughout their travels. Elegant Day-Timer Leather Journals are the perfect gift for the veteran in your life. Certificate frames: Display photos and special commmedations with pride in an attractive certificate frame. Special commendations and photos are displayed with pride in all military households. Properly display your veteran’s special commendations in an attractive certificate frame. You have lots of styles and sizes to choose from at On Time Supplies, so you’re sure to find the perfect certificate frame for your display. We here at Office Ink hope these Veterans Day gift ideas help you show your veteran the love, admiration and respect for service we all feel. Personalized Christmas address labels: make your own custom address labels. The holiday season approaches, so it’s time to think about your Christmas card list. In addition to friends and family, be sure to send Christmas cards to your boss, colleagues, clients and most valued customers. Christmas cards are a quick and easy way to market yourself and your work. With so many people on your Christmas card list, you don’t want to address all the envelopes by hand. Address labels are clearly the way to go, so why not spread a little holiday cheer with customized Christmas address labels? In fact, you can make custom address labels for any occasion using free address label templates, from bride and groom address labels for wedding invitations to baseball and border collie address labels just because! You can google around for a free address label template, or visit Avery.com, where you can download a free address label software or design and print custom address labels online. The Avery address label software also lets you merge you contact list for even more convenience, or you can type in each recipients mailing information. 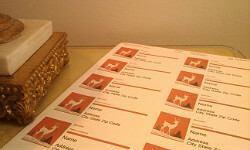 I used the Avery address label design studio to make my custom address labels this year. Avery has a nice selection of Christmas icons you can use, but I fell in love with this vintage-y reindeer design I found and used that instead. Keep in mind, shipping labels work better than small address labels when you really want to showcase a fantastic Christmas picture. You get the best color printing results when you use the matte white Avery mailing labels, but I’m always looking for ways to go green, so I used the EcoFriendly Avery shipping labels. My personalized address labels still look pretty great! 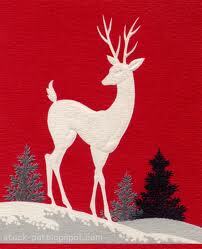 Avery clear address labels: clear mailing labels are great for envelopes in festive Christmas colors. Avery foil mailing labels: address labels with a metallic gloss in silver or gold are festive and elegant. Remember, your printable Christmas labels design is only limited by your imagination: you can create printable Disney address labels, Christian address labels and more. So have fun with your custom address labels project! Office furniture clearance sale: get new office furniture cheap! No matter what I’m shopping for, I always head straight for the clearance section in the back of the store. If you’re cheap thrifty like me, you probably do the same. After all, that’s where all the real bargains live. Well, just like your favorite brick and mortar stores, your favorite online office supplies store now has an office furniture clearance section! On Time Supplies has a ton of wholesale HON office furniture, discontinued Bush office furniture and more to liquidate. I’m talking quality, new office furniture here too: contemporary office desks, beautiful wood bookcases, vertical and lateral file cabinets – basically all of the stuff you put off buying until you find a good deal. So whether you need to furnish a conference room or a home office, go bargain hunting at On Time Supplies. While you’re checking out the discounted office furniture, browse the knowledge base articles in the On Time Supplies community section. You’ll find great advice on choosing the best office desk for your work area, the best ergonomic office chair for your body type and even tips on the care and cleaning of your wood office furniture. 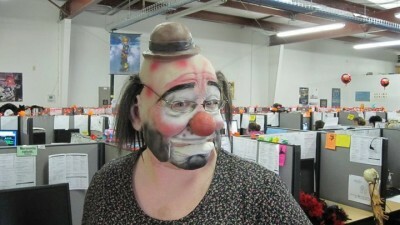 Office Halloween Party: show us Halloween Pictures from the office party! I won’t lie – most of the time, working from my home office is the most awesome thing in the world and you should all envy me. But one thing I miss about working on-site is office parties. Particularly office Halloween parties. So, indulge me Office Ink-ers and show me your Halloween pictures. Scary Halloween pictures, funny Halloween pictures – I want to see them all! Post your Halloween pics in the comments, but be nice: make sure your Halloween picture is no bigger than 300 x 300 px.